This is a busy month in Puerto Rico. February welcomes the biggest celebration of the year in the Ponce Carnival, the region's preeminent classical music festival in the Caribbean, and sports events that bring world class baseball, marathon runners and street performers to the island. Add a BBQ fest and whale watching, and you've got something going on all month long. 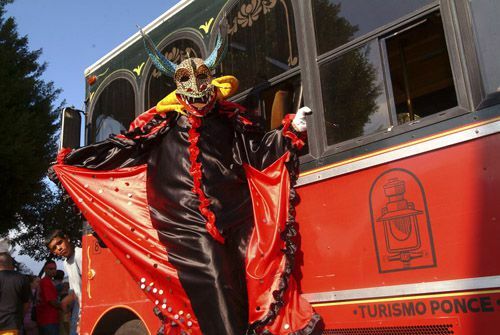 Nothing eclipses the pageantry of the Ponce Carnival, an event that draws hundreds of thousands of visitors to Puerto Rico's Second City each year. It's prime whale-watching season on the west coast of Puerto Rico, and there are several boats that will take you out and get you up close to migrating humpback whales. February 1-3: Dubbed the "Best Half Marathon in the World." the San Blas Half Marathon brings athletes from around the world and an expected 250,000 spectators to Coamo. The run takes place on the 3rd, but is preceded by a weekend-long festival. February 13-17: Think you're a daredevil? How would you stack up against these guys? Launching from Arecibo, Xtreme launches its annual freefall festival just before Valentine's Day. February 14: Valentine's Day is quite popular on the island. The island often has special deals and dinner offers at hotels and restaurants. February 27-March 5: The Ponce Carnival is Puerto Rico's answer to Mardi Gras, Rio's Carnaval, and every other pre-Lent celebration. And if New Orleans has its beaded revelers and Rio its costumed dancers, Puerto Rico has its Vejigantes, elaborately masked figures representing local folkloric demons. Throughout February: Whale-watching season continues in the west coast of Puerto Rico, when humpback whales can be spotted off the coast. An excellent spot to see them is the observation park at the Rincón lighthouse.